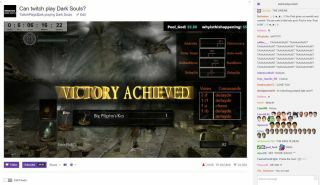 Twitch Plays Dark Souls may have turned into an improvised, turn-based version of the game, but it's still fascinating to watch: especially if you've ever wondered what kind of build is necessary under these (admittedly pretty unlikely) circumstances. The answer, at least where the Capra Demon is concerned, seems to be 'poise'. You just need a lot of poise. The Taurus Demon went down last week, but now I have two boss battles for you: the Belfry Gargoyles and the Capra Demon. The latter is one of the first significant difficulty spikes for newcomers to the series, so it's amusing to see Twitch make such short work of it. (Hint: it's not actually as easy as it looks). Thanks again to YouTuber PvtBooger for editing the pauses out of these encounters.